A Christmas Promise is a re-release of one of Mary Balogh's beloved Christmas Signet stories. This book was originally released in 1992, and I can't tell you how happy I am that it's finally available again. This is the first time I had the pleasure of reading it. 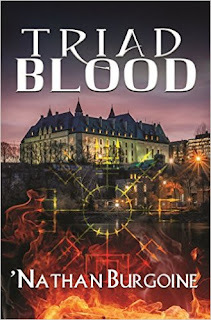 Raldolph Pierce, Earl Falloden inherited the earldom from a cousin who left him deep in debt. He is in love with Miss Dorothea Lovestone and cannot offer for her due to his dire financial situation. Joseph Talloden, a successful coal merchant and one of the Earl's debtors, purchased all of Falloden's debts and proposes that as an exchange for cancelling those debts, Randolph marry his daughter Eleanor, consummates the marriage and that they live together for the first year of their marriage. Talloden is dying and the wedding must take place immediately as he wants to leave his beloved daughter settled with the man he chose for her. Randolph is left with no choice but to marry Eleanor, a 'cit', or go to debtor's prison. He accepts his fate, but is contemptuous of Eleanor for marrying a man for his title and position. Ms. Eleanor Transome was educated as a lady, but as the daughter of a merchant -- a 'cit' -- has suffered plenty of humiliations from the aristocracy because of her background. Her only wish is to marry for love. Eleanor loved her second cousin Wilfred, but after receiving a letter from him dashing all hopes gives up her dream of marrying for love and accepts her fate. Eleanor will honor her father's last wishes and marry the Earl of Falloden. She, however, is contemptuous of a man marrying for money after having misspent his fortune on gambling and other pleasures. An eventful wedding night surprises Randolph and Eleanor both as pleasurable and more than either expected. By next morning Mr. Transome is dying and Eleanor, numb with grief, is unwilling to seek solace or react in front of her aristocratic and unwanted husband. Her seemingly cold demeanor gives Randolph the wrong impression. Before he dies, Mr. Transome extracts a promise from Eleanor not to mourn for him and to celebrate Christmas with all its warmth and joys. But how can she? Her adored father is dead and she's married to a man who's in love with someone else, has a mistress, and married her for her money. Eleanor invites twenty of her Transome family members to their country estate Grenfell Park, prepares for rejection from her aristocratic husband and a less-than joyful Christmas. Balogh begins A Christmas Promise with enmity between our protagonists and slowly develops the romance and a joyful and warm family story. There are quite a few conflicts to resolve in this novel: the marriage of convenience, the misunderstandings between the couple, grief, and the class differences. Mary Balogh weaves those conflicts into a magical family Christmas story. Eleanor is defensive for much of the story and lashes out at Randolph. She always seems to expect the worst from him. This comes not only from her mistaken view of him as a spendthrift, but also from her previous experiences with the aristocracy. Her suppressed grief doesn't help. Randolph initially makes mistakes with Eleanor. However, he knows how to apologize and rectifies those mistakes quickly. He's initially snobbish about her background too, but slowly recognizes Eleanor as the lady she is and comes to appreciate her family's warmth and love. Surprisingly, Randolph is open to love and making their marriage work faster than Eleanor. I really liked him and yes, I loved the way they finally found their happily ever after. This story is full of wonderful secondary characters. Both the Transome family and Randolph's aristocratic friends add much to this story. The ending to some secondary characters' story lines were a bit too perfect for me, but then again this is a holiday story. The atmosphere is joyful and warm and if you want the feeling of a family Christmas story, this is it. I couldn't help but be swept along with Randolph, Eleanor and the Transome family. 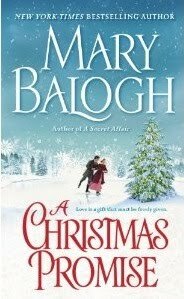 A Christmas Promise by Mary Balogh is a magical, sweet Christmas story. I enjoyed it and will read it again. Lovely. I loved this book when I first read it years ago. After your review and the one at DA, I really think I'm going to have to dig out my copy and have a good re-read. This is truly one of her classics. Thanks for such a great review. I have read some of Balogh's older regencies and really admire her skill. This one is going on my buy list. I can only count with my fingers the number of Historical Romance I've read so far. I think I liked the story now that I've read your review. I've flipped the front and back pages every time I go to Shoprite and wait for my mom to finish her grocery lists. I wasn't sure I'd go for this, but now I think I will. Thank you for a very good review Hils. Phyl, I've been looking for these Signets for quite a while and I was so glad when this one was re-released! I read it when it was first released and I'll be reading it again for the Holiday. Enjoy your re-read! ScorpioM, A Christmas Promise is definitely a great example of Balogh's skill. I hope you enjoy it as much as I did. Great review, Hils!!! I've been in on a historical kick and this one sounds like right up my alley!! I've been saving it to buy it along other books in order to be eligible for promotions... but now, not sure I can wait, LOL! Thanks Nath! I hope you enjoy this Christmas story. This will definitely fit with your historical 'kick.' LOL! Enjoy! I checked the online catalogs for the three closest libraries and none of them have A Christmas Promise. But one of the libraries had every single other title by Balogh, so I know where to go to read the rest of her works. LOL. Aww, I'm sorry to hear that! I hope you find it, but I do know you can buy it everywhere. I saw it at the pharmancy (CVS) the other day, lol!